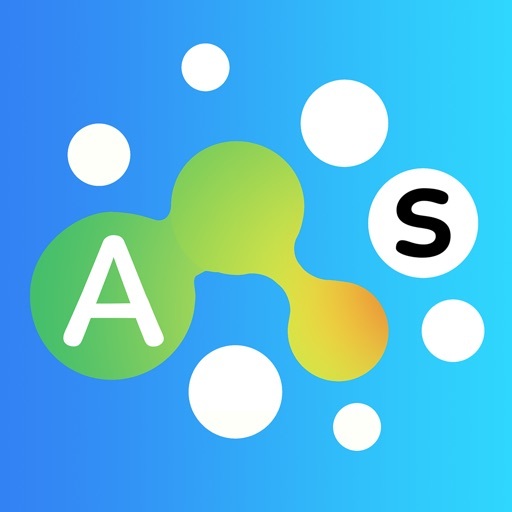 Alpha Swipe ($2.99) by Nanovation is a fast-paced word game that has you showing off your wordsmith skills in a frantic test. If you love word games like Alphabear and Spelltower, then you will get a kick out of Alpha Swipe. While a lot of my gaming time is spent on consoles these days, I am still enjoying my iPhone for some gaming in my spare time. 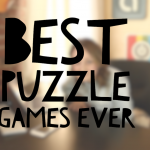 My favorite genre of game on iOS is puzzle game, but since I’m a writer for a living, I like to have a few word games on my devices as well. It’s been a while since a good word game has come out for iOS, but when the news of Alpha Swipe hit my inbox, I needed to make sure to check it out for myself. Needless to say, I’m not disappointed. Visually, Alpha Swipe is gorgeous with a simple and clean minimalistic aesthetic that will appeal to many. 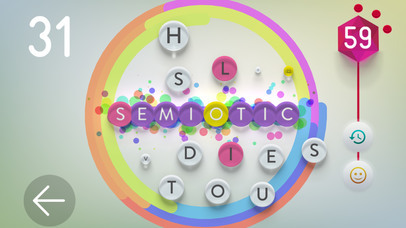 The game is rendered in 2-D for the most part, but it does have a bit of depth to it because of the raised letter tiles and drop shadow effects. The soft, off-white backdrop is subtly tinted with pastel hues that make the letter tiles pop more, especially when they’re colored to indicate that they’re selected. Animations in Alpha Swipe are smooth and fluid, especially the physics involved with the floating letter tiles on the screen. There is also a delightful atmospheric soundtrack that is captivating and engaging, helping you focus on finding as many words to spell out as you can. Nanovation certainly did a great job with Alpha Swipe in terms of the game’s look and feel. 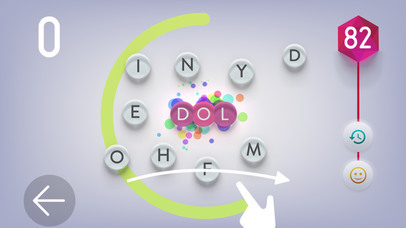 There is only one game mode in Alpha Swipe, and the goal is simple: spell out as many words as you can before time runs out. The only rule is that the words have to be at least three letters long. 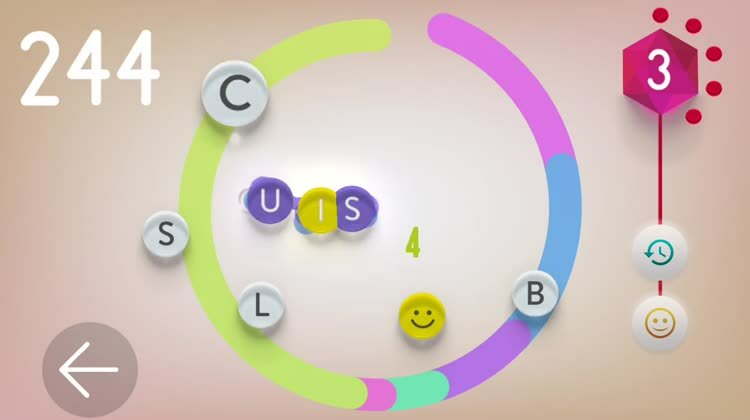 While the gameplay is fun, I think it could have used another mode or two just to make things more interesting because only one mode in a word game can get a bit repetitive after a while. However, if you’re the type of person who loves chasing for the high score in word games, then this is perfect for you. Controls in Alpha Swipe are as simple as they come. 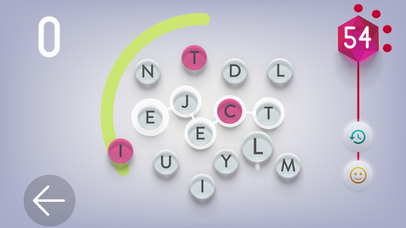 To spell out words, just tap on the letter tiles that you want to use, but make sure that they’re in the proper order. Things start out pretty slow but the pace gets ramped up quickly enough as more tiles pop up and the current ones float around more easily. When the game detects a valid word, you will hear audible feedback, which is helpful in case you’re in full-on panic mode. To confirm and submit a word, just swipe right on the screen. If you want to get rid of the word entirely, just swipe left to deselect all letters, or you can tap on the individual tiles that you want to get rid of. The longer your word is, the more points and extra time you earn. To know how much time is left on the clock, just look at the rings around the letter cloud. To make keep things a bit more interesting, Alpha Swipe does feature challenges that you can strive for, such as collecting 10 red tiles to get a ruby. The red tiles will also net you bonus points and time, and the smiley face tiles are pretty much wild cards, so make sure to take advantage of them when you can. 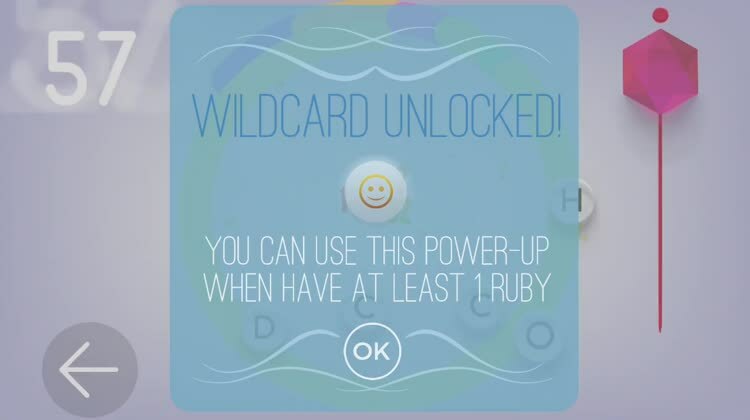 The game does have in-app purchases for more power-ups if desired, though this is completely optional. The game ends when the time rings run out, and your score is calculated depending on the words you submitted. Remember, the longer the word, the more points you get, especially if you use less common letters. 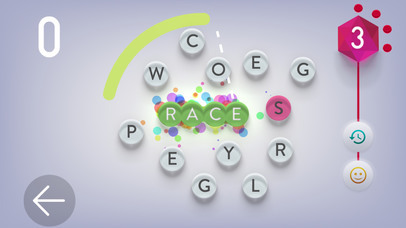 At the end of each round, the game will calculate your average word length and even tell you what your all-time best word was. 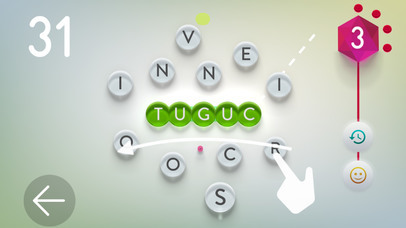 I’ve just started Alpha Swipe, but as a word game fan, I’m enjoying it a lot so far. The minimalist aesthetic looks gorgeous, the music is a joy to my ears, and the frenetic gameplay is a real challenge even for seasoned wordsmiths. I do think that sometimes it can be hard to select the letter tile that you want because they run a bit on the small side when there are more popping up, but it’s not a deal breaker. It would be nice to see more potential game modes added in the future, though. 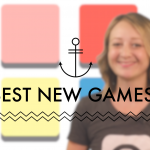 I highly recommend checking out Alpha Swipe if you’re a fan of word games. You can find Alpha Swipe on the App Store as a universal download for your iPhone and iPad for just $2.99. There are optional in-app purchases for power-ups.